Now here is a treat for you lot. The splendid persons at Dabbler Editions, purveyors of e-books to the e-literate, have launched upon the world an e-anthology of Mr Key’s outpourings. 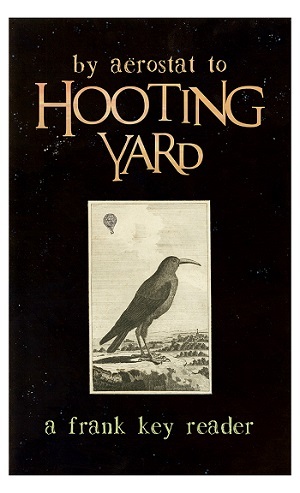 By Aerostat To Hooting Yard : A Frank Key Reader contains 147 stories selected by the estimable Roland Clare, who has also written a scholarly introduction. Truly it may be said he has pored over numberless sweeping paragraphs of majestic prose and has actually managed to work out some of the things going on inside Mr Key’s brainpans. According to the Dabbler, the anthology is “baffling, brilliant, brutal, and hysterically funny”. It is also dirt cheap, well within the means of even the most impecunious reader (few, if any, of whom are as impecunious as Mr Key himself). And remember, you do not need a Kindle to read a Kindle e-book. There are plenty of ways to read this earth-shattering and heart-rending tome on any of the electronic contraptions you might have lying about in your hovel. Just ask your nearest computer whizz person. So the basic idea is that you go and buy the book from amazon.co.uk or amazon.com or amazon.wherever-you-are. You then award it five stars and post a review explaining that it is the most noble effusion of the human spirit since [insert previous noble effusion of your choice]. You then harry and hector everybody you know, and buttonhole strangers in the street, also to buy the book. And on the seventh day you may put your feet up and actually read it. Come on, readers. If you cannot make this the bestselling e-book of all time, you can at least ensure that Mr Key is in with a chance of winning the mrs joyful prize for rafia work. N.B. Those of you active on Facecloth and Twitter should strain every sinew to splurge news of the book all over the place. Remember, you will get your reward in heaven. This entry was posted in Buy The Books, The Dabbler by Frank Key. Bookmark the permalink. I shall get it immediately! I shall get it eventually! Can we have a printed Lulu version of this book please? I need a Halloween present for my footman and this would be ideal. He is an ‘electro-phobe’ and only reads from paper (like me). Ordered, received and will be read this eve. Mr. Key once ‘baked me a cake’ for my birthday, so how could I not purchase? As a long-time love of House of Turpsa and possessor of my own model house, I feel my life is nearing completion with this essential purchase. My sincere thanks to all responsible. Prof Atton : Your longstanding devotion to Hooting Yard is much appreciated. I confess I do not recall the baking of a birthday cake, with or without inverted commas.